Less than a year after Jessica Peptis dropped out of high school in her junior year, she became pregnant with her son Aiden. Struggling to survive as a single mother wasn’t easy, but she had anticipated the hardships and softened the impact by earning a GED before he was born. 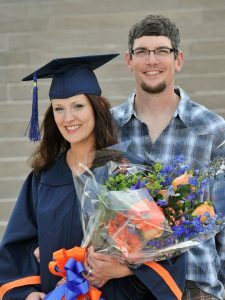 The day she enrolled Aiden in pre-K, she went home and opened the phone book to “colleges.” Syracuse University was the first listing she saw, and that day she called University College to set up an appointment with an advisor to discuss part-time study toward a degree. That was more than a decade ago, and Jessica recently completed a dual degree in English Textual Studies and English Education with a goal of teaching English to at-risk high school students. “I started SU in 2002, and although I had to take quite a few semesters off due to personal life circumstances, I made an effort to return to school as soon as possible,” she says. Jessica is now a substitute teacher in the Syracuse City School District and a writing tutor for HEOP students at UC. She also teaches a College Survival Workshop, which she hopes will become a college class.